This general store in Gimli was constructed in 1898 by Hans Pjetur Tergesen and opened for business on 1 January 1899. It has been owned and operated by three generations of his descendants. It is the oldest operating general store in Manitoba and an excellent example of a rural community store. The vernacular-style building is a rectangular wooden structure with a flat roof. A wooden parapet with a bracketed cornice gives the building a more imposing appearance. The interior possesses most of its original furnishings. The 1899 general store was a two-storey structure clad in pressed tin to resemble brick. 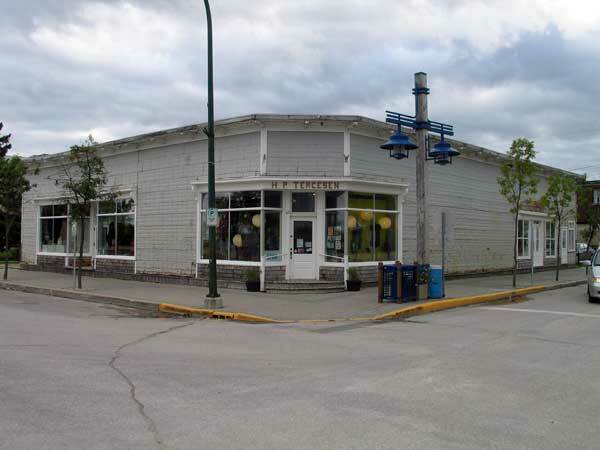 In 1912–13, a two-storey addition provided more space for Tergesen’s dry goods and clothing sales, and room for a drug store, dentist’s office, ice-cream parlour, and a barber shop. A second floor that had first served as the Tergesen family living quarters was removed in the 1920s. A plaque beside the store was unveiled in 1999 by the Manitoba Heritage Council. In the 2000s, the building was part of the Manitoba Prairie Icons Program.